TOKYO (Feb 28): The dollar was steady early on Tuesday, enjoying support after U.S. President Donald Trump flagged a big boost in government stimulus, and sought a "historic" increase in military spending. Trump will ask the U.S. Congress to boost Pentagon spending in the next fiscal year by $54 billion in his first budget proposal, a White House budget official said on Monday. "The talk regarding military and infrastructure spending raised expectations towards Trump's speech to the Congress later today, lifting the dollar and Treasury yields," said Shin Kadota, senior forex strategist at Barclays. The lift for the dollar, however, was limited as the military spending increase would be accompanied by a cut in the same amount from non-defense spending, including a large reduction in foreign aid. Moreover, investors also took a wait-and-see approach ahead of Trump's closely-watched Congressional address later in the day, capping the dollar and crimping overall market activity. The dollar rallied hard soon after Trump won the U.S. elections in November, boosted by hopes that he would introduce large fiscal stimulus and reflationary plans. But the currency has sagged lately with the Trump administration yet to hammer out clear specifics. "It remains to be seen how much the dollar can gain from Trump's speech, as specifics regarding tax reforms, which is of key interest to the market, may not be available until March," Kadota at Barclays said. 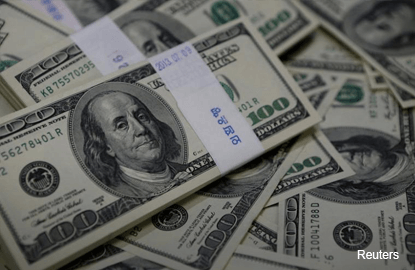 The dollar index against a basket of key currencies extended the previous day's modest gains and was up 0.1 percent at 101.170 after initially trading as low as 100.690 overnight. The greenback was steady at 112.730 yen after rising 0.7 percent overnight, when it had initially plumbed an 18-day low of 111.920. The euro was a shade lower at $1.0583, having come off from a one-week high of $1.0631 scaled the previous day. A slight ebb in concerns towards the French presidential election has helped the common currency, which had sunk to a 1-1/2-month low of $1.0494 last week. The pound fetched $1.2442 after sliding to a 12-day low of $1.2384 the previous day as talk of another possible Scottish independence vote added to fears about Britain's future as it prepares to leave the European Union.